Welcome everyone to the January edition of our wonderful club Newsletter! Starting 2017 with a swim! Reviews: Film s & Panto! Click on the file below to download it - we hope you enjoy reading it! ​THE ROTARY CLUB OF MAIDENHEAD BRIDGE INVITED TOWN RESIDENTS TO PICK UP SOME HEALTH TIPS AND INFORMATION ALONGSIDE SALE SHOPPING THIS WEEKEND. OVER 80 PEOPLE TOOK THE ROTARIANS UP ON THEIR OFFER, RECEIVING BLOOD PRESSURE CHECKS, CHOLESTEROL CHECKES, DIABETES CHECKS AND ADVICE ON EXERCISE AND HEALTHY EATING. The Rotary Club of Maidenhead Bridge invited the community of Maidenhead to kick off 2017 in a healthy way with a free, informal Health Awareness Day in the Nicholson Centre last Saturday, joined by teams from Lloyds Pharmacy and The Stroke Association. The Rotary Club took over a unit in the Nicholson Centre from 10am to offer advice and information on getting fit, eating healthily, the effects of high cholesterol and how to manage it, diabetes, and the risks of high blood pressure – all completely free of charge with no obligations. Over 80 people took the club up on their offer. For the first time this year the club teamed up with Lloyds Pharmacy to offer free cholesterol checks and blood sugar tests; giving advice on how to lower cholesterol levels and avoid contracting diabetes, which is an increasing healthcare concern. Of those who were tested 10 were advised to make changes to their diet immediately, 5 were asked to visit their GP for further tests and 1 person was referred immediately for in-depth cholesterol checks. The Health Awareness Day is just one of the many local community based activities carried out by the Rotary Club of Maidenhead Bridge, alongside a free Easter family fun day in Grenfell Park and a close working relationship with FoodShare helping to feed the hungry in Maidenhead and the immediate area. ​DID YOU MAKE A NEW YEAR’S RESOLUTION TO GET FIT THIS YEAR BUT DON’T KNOW WHERE TO START? THE ROTARY CLUB OF MAIDENHEAD BRIDGE INVITE YOU TO PICK UP SOME HEALTH TIPS AND INFORMATION ALONGSIDE YOUR SALE SHOPPING NEXT WEEKEND! The Rotary Club of Maidenhead Bridge is helping the community of Maidenhead to kick off 2017 in a healthy way with a free, informal Health Awareness Day in the Nicholson Centre on Saturday 21st January between 10am – 3pm. The Rotary Club will be taking over a unit within the Nicholson Centre from 10am to offer advice and information on getting fit, eating healthily, the effects of high cholesterol and how to manage it, Ovarian Cancer and the risks of high blood pressure– all completely free of charge with no obligations. In addition the club has trained medical practitioners joining them to carry out blood pressure checks and cholesterol checks, all free and completely confidential. This is one of the many local community based activities carried out by the Rotary Club of Maidenhead Bridge, alongside a free Easter family fun day in Grenfell Park and a close working relationship with FoodShare helping to feed the hungry in Maidenhead and the immediate area. Rotarians are a cross-section of the local community. The regular meetings are a great way to keep in touch with what is happening in your local area and beyond. A Rotarian is welcome at any Rotary meeting anywhere in the world. If Sunday mornings aren’t convenient for you, or you would prefer to attend a weekly Rotary meeting, still get in touch as we can tell you more about the other two Rotary Clubs in Maidenhead, which may offer exactly what you are looking for. 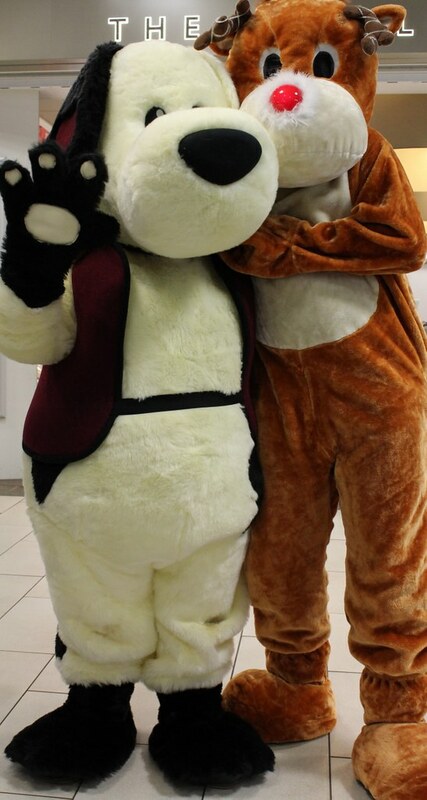 It was a race to the finish line at the annual Reindeer Race in the Nicholsons Centre before Christmas. For the fourth year running the event, organised by the Rotary Club of Maidenhead Bridge, pulled in the crowds to watch competitors wind toy reindeers and sleighs across the line. Races cost £1 a go with money raised going towards Hearing Dogs for the Deaf, which trains and provides assistance dogs to the deaf and hard of hearing. This year the event included a reindeer mascot and one from the charity, which the rotary club's Lisa Hunter said helped encourage children to have a go. Lisa said: "It has been very popular. The toys were made by members of the rotary club four year ago and they are still going strong." Maidenhead Bridge Rotary Club celebrated its 4th birthday on Sunday with a party for members, friends and family. The innovative, vibrant and flexible club was founded back in 2012 to offer young professionals and people with families the opportunity to get involved in the local community whilst meeting new people and having lots of fun. In addition the club also welcomed four new members to their fold, Costa Televantou, Rebecca Dolopei, Katherine Harris and David Gunn, taking their total membership to 49! The club organises several key events each year including the Easter Family Fun Day in Grenfell Park which now attracts over 500 local families each year, as well as the annual Health Awareness Day in January which gives advice to local Maidonians about blood pressure, healthy hearts, diabetes etc with the support of professional organisations. “We are really looking forward to a new event next February – 24 challenges in 24 hours, which will see members take on 24 different challenges including swimming, Zumba, trampolining, mental challenges and Tai Chi over a 24 hour period, all in aid of charity”, Victoria shared. A horde of undead flesh-eating monsters shuffled their way through the town centre on Saturday evening. More than 200 zombies, with their clothes ripped and blood dripping from their rotting faces, departed from The Bell pub in Queen Street before limping and groaning their way to the town hall through the Nicholsons Centre. It was all part of the town's fourth Zombie Walk. A Halloween flash mob showed off their ghoulish dance moves, watched on by the zombified town crier Chris Brown and Maidenhead United mascot Yorkie the Magpie – whose team had risen from the dead in their game just hours before. Zobmies then either headed to the Royal Voluntary Service centre in York Road for a 'monster mash' ball or a fringe event at the Anchor pub. The event is run entirely not-for-profit by community based volunteers from Rotary Club of Maidenhead Bridge, Maidenhead Live, and Maidenhead Round Table. This year we are all coming together to raise awareness and money for local charity Number 22. 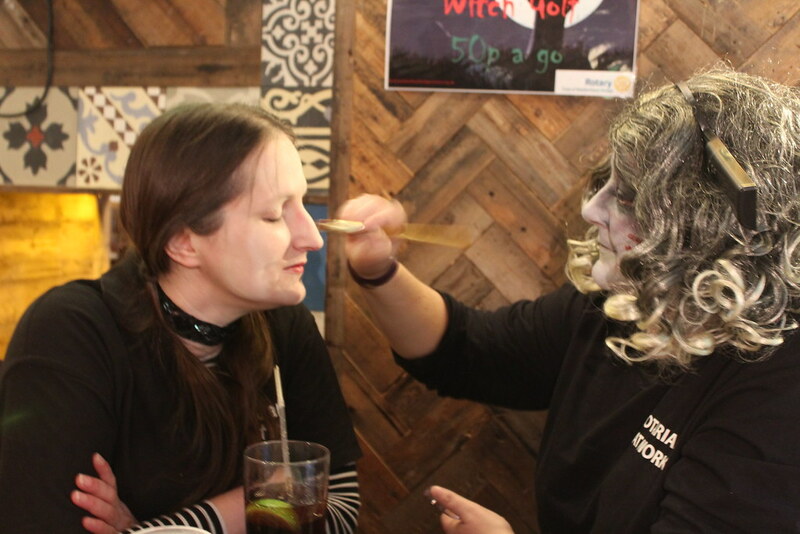 Vicky Lunt, founder of the Maidenhead Zombie Walk committee, said: "It was great fun and everyone appeared to have a really good time. My favourite part was entering the Nicholsons centre when the staff began flashing the lights on and off for a super spooky effect." For over 30 years, Rotary has been working hard to rid the world of polio – a terrible disease that can kill or severely disable children and adults; and this year Maidenhead Bridge Rotary Club is bringing a bit of purple to Maidenhead to spread awareness. When Rotary started the campaign to eradicate polio, there were cases present in 125 countries worldwide, now just two countries remain polio endemic; Afghanistan and Pakistan. During that time, Rotary has helped immunise over 2.5 billion children and reduce the number of polio cases by 99.9%. The eradication of polio is tantalisingly close and we want you to get involved and help us finish the job. Rotary has partnered with the Royal Horticultural Society (RHS) to plant 5 million crocus corms this October, which will flower in February 2017 to brighten up communities across Great Britain and Ireland. It’s time to get those green fingers at the ready! Maidenhead Bridge Rotary were out in force on Saturday 15th October in Grenfell Park armed with 5000 crocus corns to plant. By covering our parks, gardens and green spaces with crocuses, we are aiming to demonstrate how the humble crocus can symbolise a colourful splash of hope for a new beginning for children and how working together whilst having fun in the process can make a huge difference. It’s been one amazing year at Maidenhead Bridge Rotary Club with hundreds of zombies, rabbits, reindeer and health checks being just some of the many activities the club has been involved with. On Saturday the club celebrated the end of the Rotary year with a picnic in the sunshine. And there was a lot to celebrate as the group of young professionals and volunteers have somehow managed to fit in 145 events over the last 12 months ranging from hands-on volunteering such as supporting FoodShare, to socials including walks in the countryside and plenty of pub visits, to fundraising for local and international charities, to networking! Outgoing Club President Adam Hunter had set some pretty high goals for his year, but he also wanted all members to have fun and make new friends, which was most definitely achieved! One of the clubs key events of the year was a Health Awareness Day in January, giving advice to local Maidonians about blood pressure, healthy hearts, diabetes etc with the support of professional organisations. On that day alone over 110 people had their blood pressure, cholesterol and blood sugar levels checked, 21 people were advised to visit their GP within a month, five were advised to visit their GP within a week and two were advised to visit a hospital immediately. This just proves the value of that day, potentially saving people’s lives. The club has also enjoyed organising the annual Reindeer Racing event in the Nicholson Centre before Christmas, supporting Hearing Dogs for Deaf People, the 5th annual Easter Family Fun Day in Grenfell Park, Maidenhead Art Jam, assisting with the annual Zombie Walk and many, many other events. At the start of the year on July 1st 2015, the club set the goal of 1400 hands-on volunteer hours, and by the end of June the enthusiastic club had well and truly smashed this goal, reaching 1,505 hours! It’s not all been about volunteering our time, as club they have also raised over £6,000 for a variety of local, national and international charities. Maidenhead Bridge Rotary has welcomed 9 new members to the club over the last 12 months, all of them have got stuck into volunteering and the club is proud to have them in their fold. Members of the group are young professionals, volunteers and people with young families, from all walks of life with ages ranging from 22 to 55. “I know Victoria is going to do an amazing job with passion, ease and take our club into the next chapter of its life. I wish her all the best and hope she has as much fun as I have.” Adam continued. Members of Maidenhead Bridge Rotary Club were out in force last weekend, giving up their time and talents to volunteer at a number of events in our great town as part of National Volunteers’ Week. Volunteers’ Week is an annual celebration of the fantastic contribution millions of volunteers make across the UK – and it’s taking place from the 1-12 June 2016. The first event for the community-focussed Maidenhead Bridge Rotary Club was helping with was the monthly Alley Group clean-up. Members Nisha Chettri, Sushi Gow and Lisa Hunter spent a couple of hours working with the team to clean up the alley off Bailey’s Close, north of Kidwells Park. The merry team picked up litter and scrubbed out graffiti, just one of the ways the group are doing their best to improve our town. The second event, which was organised solely by the club, was a diabetes awareness day and free blood sugar checks, with the help of The Silver Star Diabetes Team and Diabetes UK. The team worked hard all day on the High Street, offering advice on how to avoid contracting diabetes, which is an increasing healthcare concern. Of over 90 people who were tested 20 were advised to keep an eye on their food intake and ask their GP for a more detailed diabetes test as soon as possible. The third and final volunteering event took place at Holyport Fair, this year celebrating its 70th year! 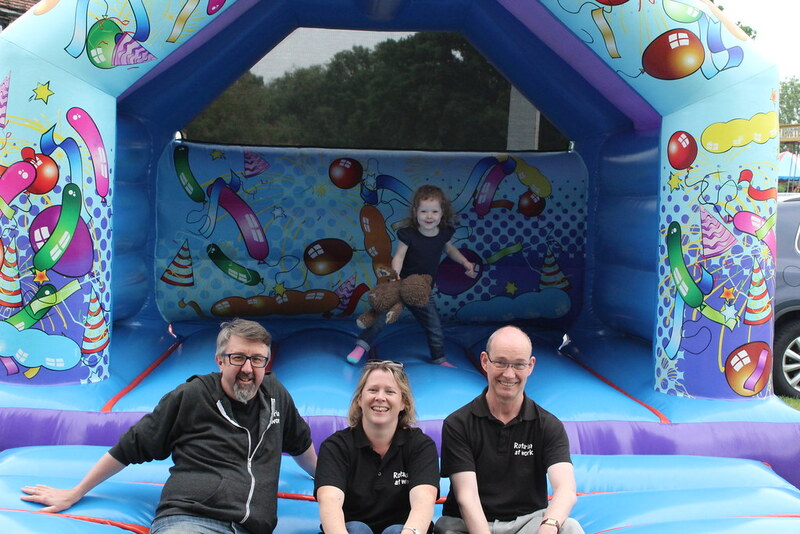 Members spent a very busy 4 hours managing the bouncy castle, a simple job some people might think….but it proved to be so popular the team had to improvise and come up with a suitable queue management system to ensure everyone got their 5 minutes of bouncing fun! 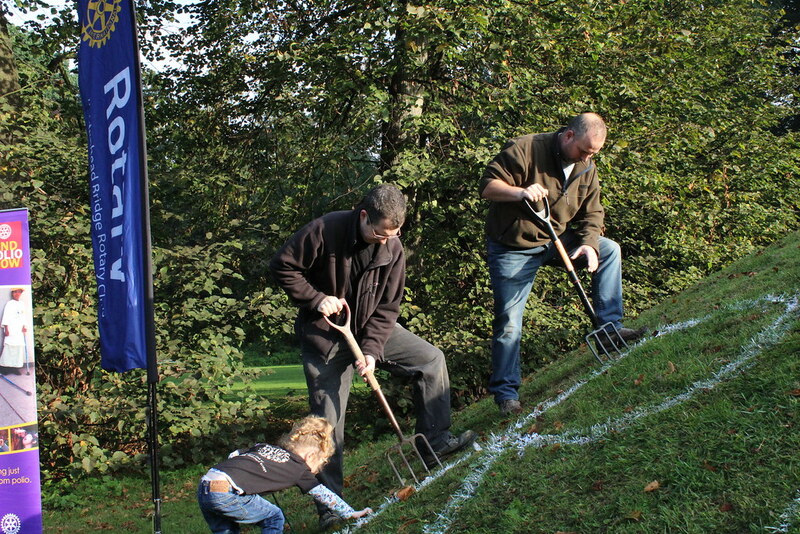 Of course this was not a problem for Rotarians, who are very experienced volunteers! Adam Hunter, Club President, commented “it proved to be a very busy weekend but one that was also a lot of fun. Volunteers do so much good in our town, and throughout the country, often without recognition. So I’d like to take this opportunity to thank all 45 members of Maidenhead Bridge Rotary Club, for continually giving up their time to help at numerous events throughout the year, you are all an inspiration and I am very proud to be your Club President”. 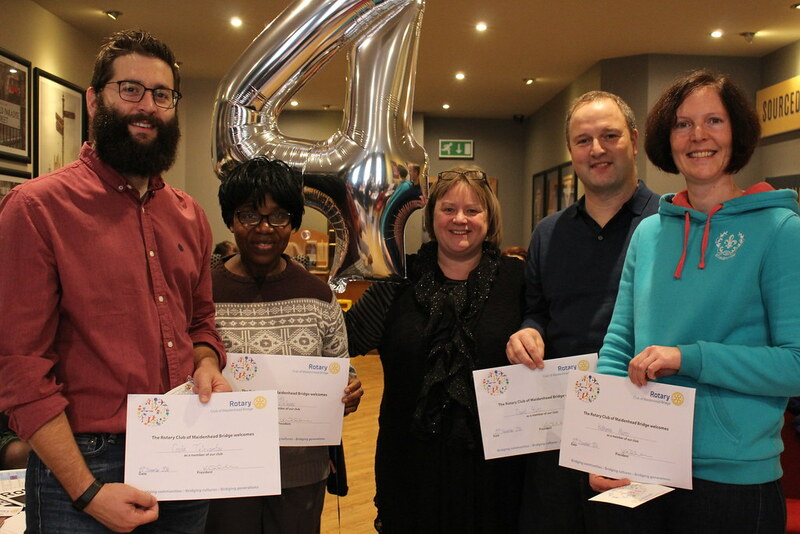 Maidenhead Bridge Rotary Club members have donated over 1,450 hours of their time over the course of the last 11 months helping each week at FoodShare Maidenhead, more recently at Calaid, at their Easter Family Fun Day, Reindeer Racing, Health Awareness Day and numerous other events.